Top variety of new potato grown in UK gardens. Charlotte produces great yields of delicious, medium-sized tubers and has good resistance to blight and scab. Perfect for use in potato salads, hot or cold, or as boiled new potatoes dripping in melted butter! Charlotte is an ideal variety for growing in patio pots and containers for gardens with limited space. Supplied as a 2.5kg sack of approx. 35 - 40 tubers. Probably the “Number 1” new potato variety grown in UK gardens, it’s not hard to see why Charlotte is so popular. 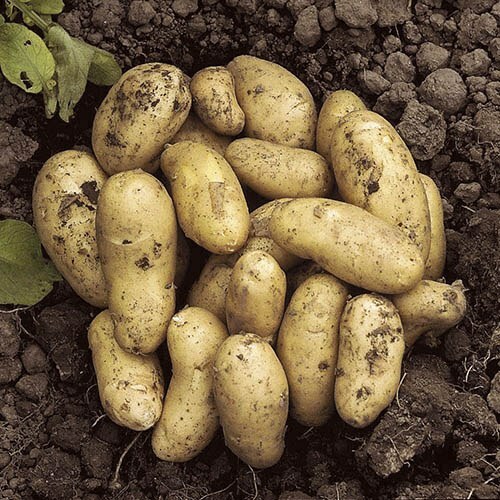 It produces great yields of delicious, medium-sized tubers that are perfect in potato salads, hot or cold, or as boiled new potatoes dripping in melted butter – scrumptious! Very easy to grow – either in patio pots and planters or straight in your garden soil – Charlotte has good resistance to blight and scab, so you’ll get consistent crops of delicious spuds! Supplied from Certified Seed from some of the UK's leading growers, We suggest "chitting" by standing round end upwards in egg boxes, in cool, light rook for 2-3 weeks, until small shoots emerge from the eyes.